"Ted Gunderson murder of P.I. Rick Post . Post worked out McMartin Preschool case. Ted Gunderson's handwritted note to Rick trying to persuade Rick to flip to Bad Guys side. Rick's body tortured & cut apart at Gunderson & Munotts Sierra Clinic." "You aren't going to do research and put my name on it, but you will do this with Rick Post or Chris Clark [?] & put their name on it. Did Post or Clark support you and your children for the past year and a half? Come on, how about working with me instead of against me? This was the idea when you quit your job - we were going to work together & both take credit - as a Team". 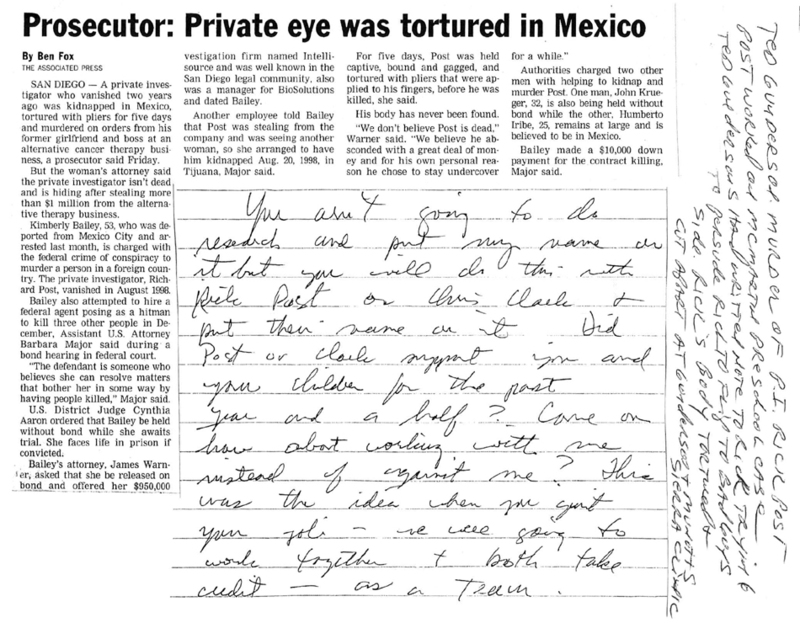 The note written by Ted Gunderson was sent to Jackie McGauley. Ted is addressing Jackie McGauley in this note, and not Rick Post as Webb claims in his note.